Info "In this game, you tap the two butterflies. You need to tap both to win." 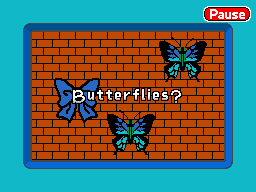 Butterflies is the third and final microgame the player makes in WarioWare: D.I.Y. 's tutorial. There are three objects placed randomly in the stage: two butterflies and one blue ribbon. The player has to tap both of the butterflies. Step 1: Putting it all together! The player learns about the main screen for microgame production and how to set the game length. The player also learns how to create custom palettes. Step 2: Using objects from another game! The player learns how to import objects from other microgames, including the Diamond Software microgames. Step 3: Using music from another game! The player learns how to import music from other microgames. Step 4: Placing an object in a general area! The player learns how to set a random location for an object to appear in in a general area. Step 5: Copying an object and its AI! The player learns how to duplicate objects and their AI. Step 6: Two win conditions! The player learns how to set up more than 1 win condition. Setting a trigger within the same conditions means both of those triggers have to be performed to win, while setting a trigger in a separate condition means either one trigger or the other has to be met. Step 7: AI -- the big picture! Penny reviews the concept of AI, or action instructions, more in-depth. Step 8: Changing the object display order! The player learns how to set up layers for objects, i.e. making a butterfly go over the ribbon rather than under it. This page was last edited on October 22, 2018, at 18:28.